e-TeleQuote is committed to giving back in our community through donation drives, paid volunteer days for employees, and additional charitable initiatives. We are proud to have been a supporter of CASA in St. Petersburg for four years. CASA (Community Action Stops Abuse) is an official domestic violence center in Pinellas County, where e-TeleQuote is headquartered. 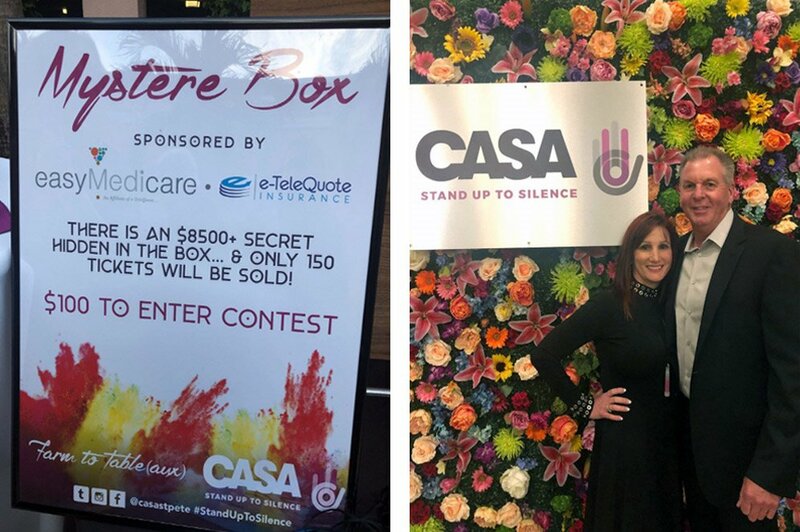 CASA works against domestic violence through “advocacy, empowerment, and social change.” The organization runs a 24-7 hotline, provides an emergency shelter, and offers a number of support services and preventative programs. Several of our executives attended the Farm to Table(aux) event hosted by CASA on Saturday, March 23rd. At the event, we were delighted to sponsor the Mystère Box raffle, where a lucky participant won a week-long trip for four to Bali. To learn more about CASA and how you could support them, visit https://www.casa-stpete.org.